I hope I find you all well and happily stitching! I have been a wee bit sick this week while it's been glorious outside. Isn't that always the case?! At least today I feel a bit better and am just sneezing a little bit now. Onto the review! 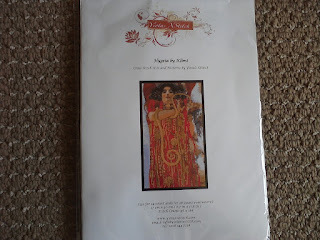 About two weeks ago, I was asked by Yiota, from Yiotas X Stitch, to review one of her cross stitch kits. I happily agreed and went to check out the 100's of kits that her site offers. I went straight to the Fine Art category to see if she had any Matisse or Klimt kits, two of my favourite artists. I didn't see any Matisse, but I was happy to see quite the assortment of Klimt kits!!! Yay!!! 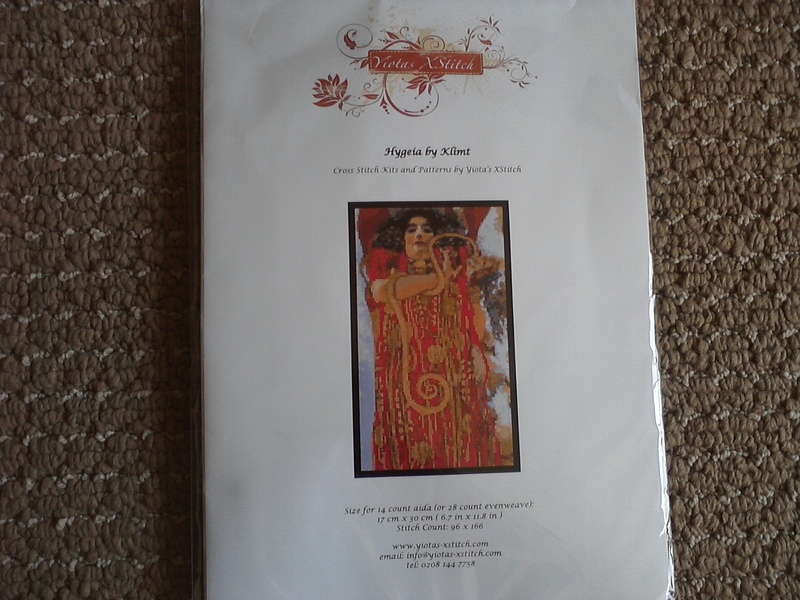 I sent her a selection of pieces that I would be happy to review and luckily, Hygeia was the Klimt needing to be reviewed!!! Did I tell you I was obsessed with Klimt? Well if not, I'm telling you now!!! Hygeia was the only surviving piece from Klimt's artwork Medicine that was destroyed in a fire and for whatever reason, this painting has enchanted me since I was 14 years old. After selecting my kit and emailing Yiota, she quickly popped it into the mail and I got the kit in a little less than two weeks later. This is really quick seeing as it traveled all the way from Great Britain to Canada!! The package came yesterday with a "Do Not Bend" stamp, so the postman actually rang my bell and handed it to me saying "I can't bend this!" I thought that was cute!! Thanks Mr. Postman for not bending it!! I carried the package to my apartment and carefully opened it. The kit's picture, chart and instructions are printed on high quality paper. The chart is easy to follow with symbols clearly marked out and different from each other. This is a very important feature for me. I also liked that the chart was on two pieces of paper which makes it easy to display. The instructions give some helpful tips about how to start and how to read the chart. The kit came with an evenweave option, which I chose instead of aida. The evenweave is 28 count and very soft. There is a needle stuck safely into the fabric. There's nothing worse than having a needle loose in a kit!! The floss given in the kit are Madeira threads, which I have never used before. 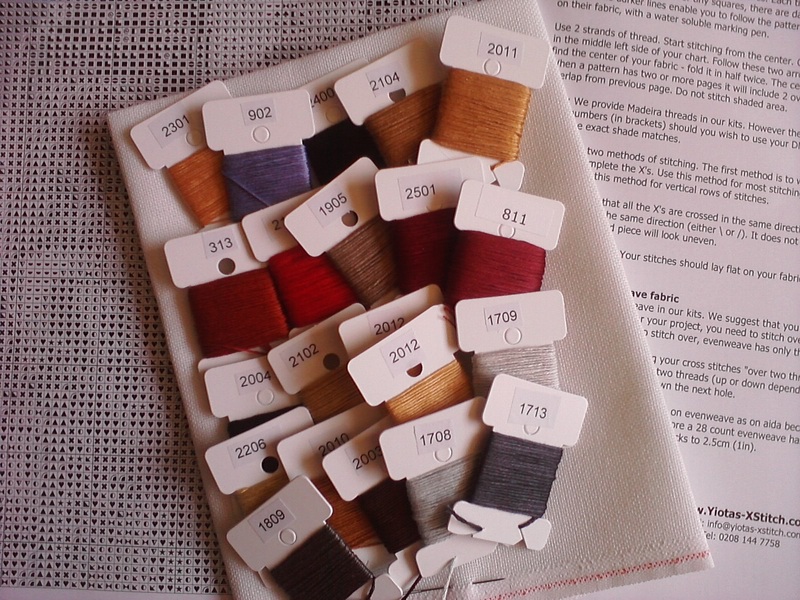 I love the fact that the threads come already wound on bobbins!! So great for the cross stitcher who wants to start the project right away!! The bobbins have the thread numbers printed in bold numbers and very clear to see. The kit does offer the option to convert the Madeira threads to DMC if you so choose to. All in all, it's a lovely kit. I can't find fault with the kit. I would highly recommend Yiota's cross stitch kit website for people looking for reliable and fast service, high quality charts, threads ready to use, and a fabulous selection of designs!!! I wanted to start Hygeia yesterday, but was under strict instructions from my hubby to lie down and NOT stitch. He said I needed to rest and that stitching wasn't resting. What does he know?! So I obeyed him for most of the day, then pulled out Tea Bath Fairy to work on a bit. I finished the tea pot handle!! That part took a really long time to do with all the colour changes. I'm happy to say that once I'm done with filling in the cup, I get to work on the fairy and be close to finishing!! 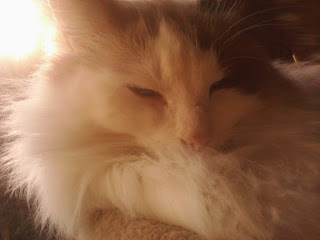 Titus sends you all some love and warmness from his perch. The colours on that Klimt kit look gorgeous - very rich. Have run stitching it. I'm not brave to tackle something like that! I hope you feel better soon and get out and enjoy the sunshine! Gosh I was just thinking Titus would be a nice warm buddy during winter time, wouldn't he?! Feel better soon! It's blisteringly hot over here already, and it's only May. Unfortunately, it means all the buildings have their ACs cranked up, and going in and out of the cold isn't good. Oh Anne! I hope you get all better soon! I personally think that when you're sick is the best time to stitch. Unless, of course, you're delirious with fever. Then maybe not so good. Congrats on tea bath fairy accomplishment! Can't wait to see progress pic! Sorry you have been unwell and hope you feel better soon. Great review for Yiots - you chose a lovely design. Titus looks so relaxed - sending him a stroke! Lovely review, for a lovely kit. I did one of her kits too, and it was wonderful. Mine had a couple of similar symbols though, and that always drives me batty!! Good overall though, so that's all that matters. I hope you get to feeling 100% soon, Anne. It's no fun feeling bad, especially when the weather is nice. Can you go outside and sit for a bit? Vitamin D is a big help with some kinds of illness, and I'd bet you could use some extra right now!! I've been out on the balcony almost every day this week. Our weather has been beautiful too. Glad you got the cup handle done, and can't wait to see the fairy!! Nice review! Sorry you are under the weather -- hope you are better fast. Love seeing Titus. He's such a cutie! Hello Anne! I have said a prayer for your wellness. :) What a neat project you have to begin. Take care. Good luck with your new kit. Hope your feeling better Anne. Love your choice of kit too. 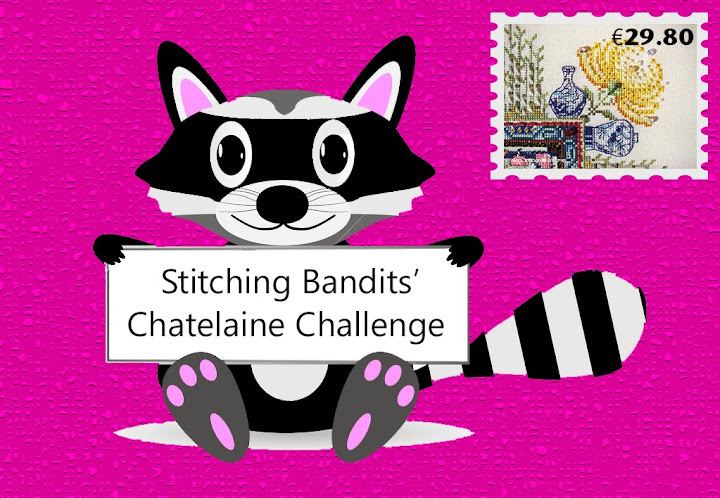 Hope your able to get back to stitching soon. I do hope you are feeling better and able to enjoy the weekend! Very pretty colors in your kit! Not sure if I would tackle such a big project, but am looking forward to watching yours come to life! You did a fabulous review here! 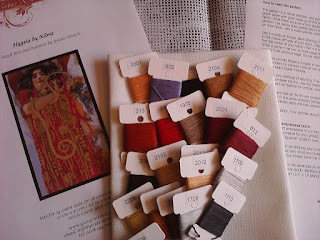 I have yet to try one of Yiota's kits but I go to her site & drool quite often : ) I'm glad you are feeling better! I love your new project of klimt and design colors. Awwwww... Titus.... I wuv Titus.... from a distance. LOL!! Ooooh, you picked a nice Klimt kit. And good think you listened to hubby. REST!!! The kit you received looks wonderful! I too love Klimt designs and have a small poster of his Tree of Life in my cubicle at work. I had not heard of Yiota's shop before but will definitely check it out. I was asked to review one as well, but I just felt I couldn't make the commitment!